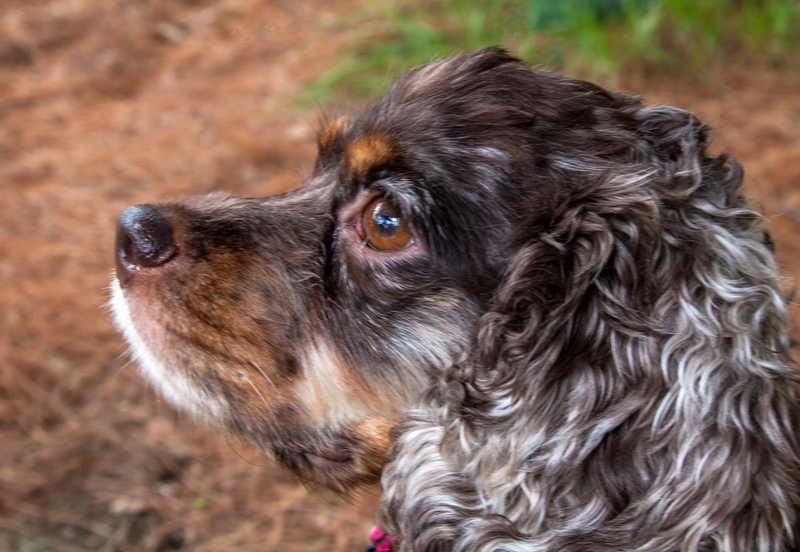 When Freckles heard the sound of a fire engine in the distance, she stopped playing and listened intently for a moment. She then leaned back her head and began to howl along with the sound of the siren. 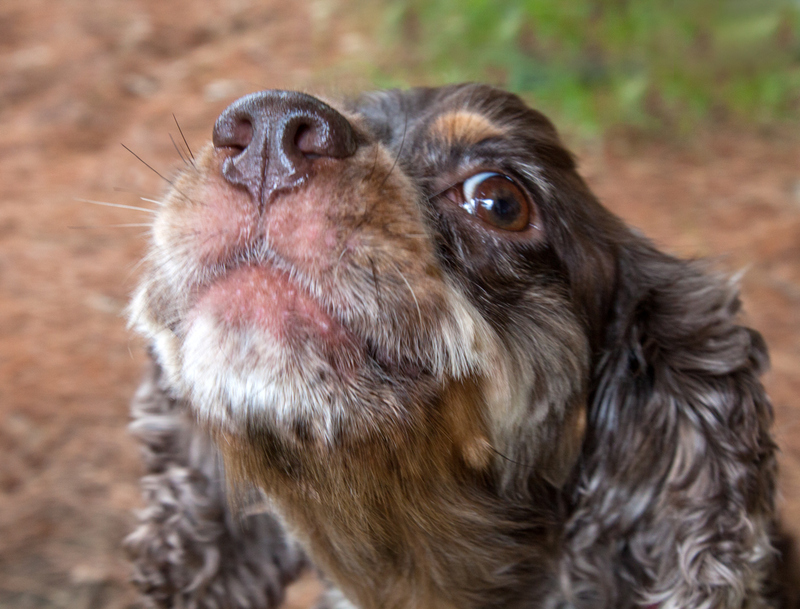 Who knew that Cocker Spaniels like to howl? For the last two and a half weeks I have been taking care of Freckles while her owners have been on their honeymoon. 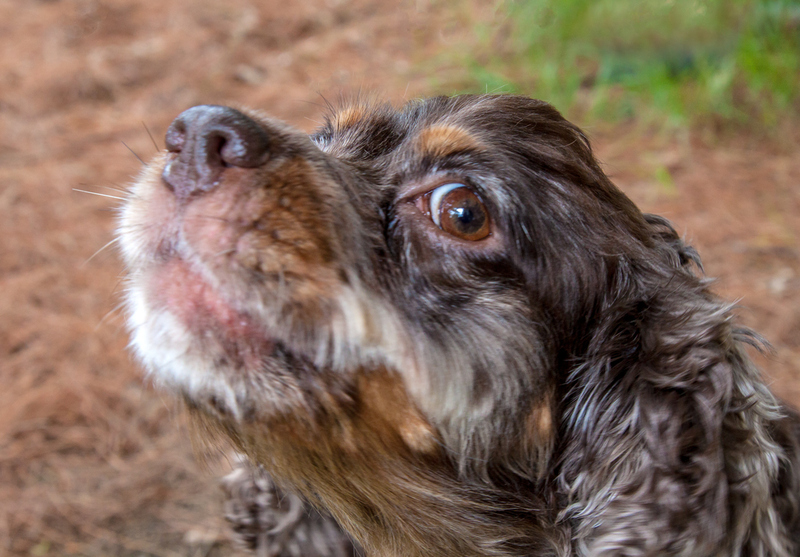 It’s been a joy (and occasionally a challenge) having a dog in my life again. During this short time we have developed our own little routines and, among other things, I’ll miss her curling up around my feet as I use my laptop. I don’t see deer very often at my local marshland park. When I do, it is generally only a flash of their white tails as they bound out of sight. 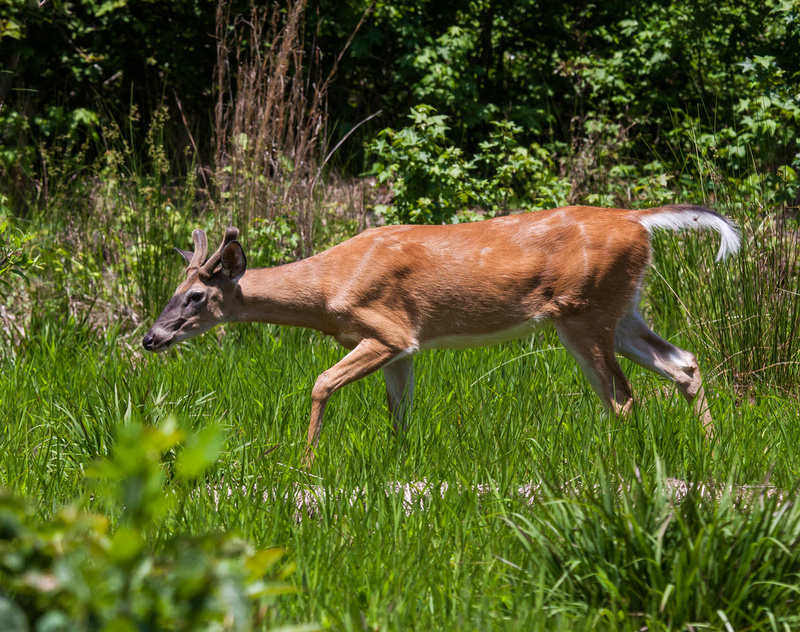 On Friday, however, I spotted a young White-tailed Deer (Odocoileus virginianus) foraging in the forest at Huntley Meadows Park on the other side of a small stream from where I was located. I stopped and crouched and the deer slowly moved closer and closer to me. I think that the deer was aware of my presence, but did not seem to view me as a threat. I did not want to move around too much for fear of spooking the deer, so I used the lens that was on my camera at that moment and stayed in place. 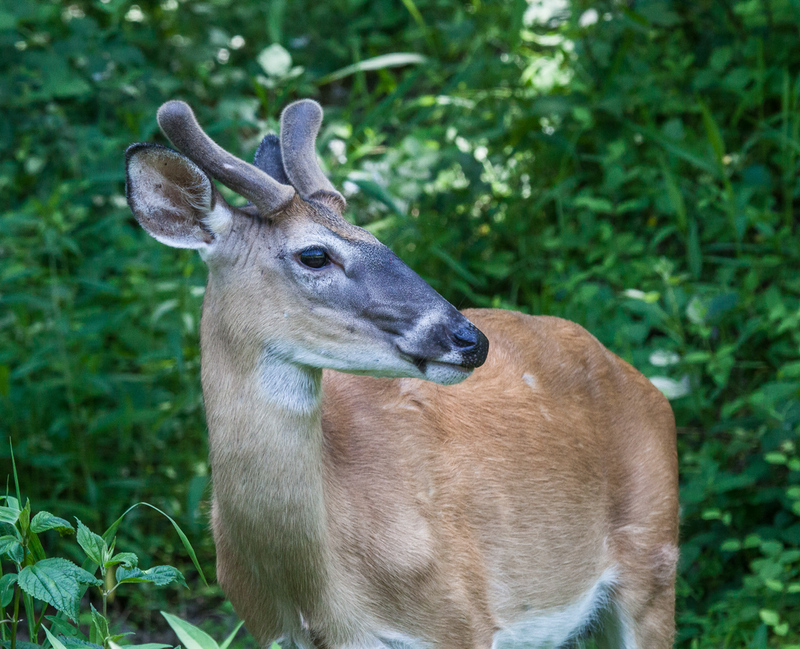 A 180mm macro lens would not have been my first choice for photographing a deer, but it worked out surprisingly well. As the deer moved forward, I thought it might try to hop over the stream right where I was at, but eventually the deer moved upstream a bit and made its way to the side of the stream on which I was standing. It lingered for a while in a field before it finally disappeared from sight. 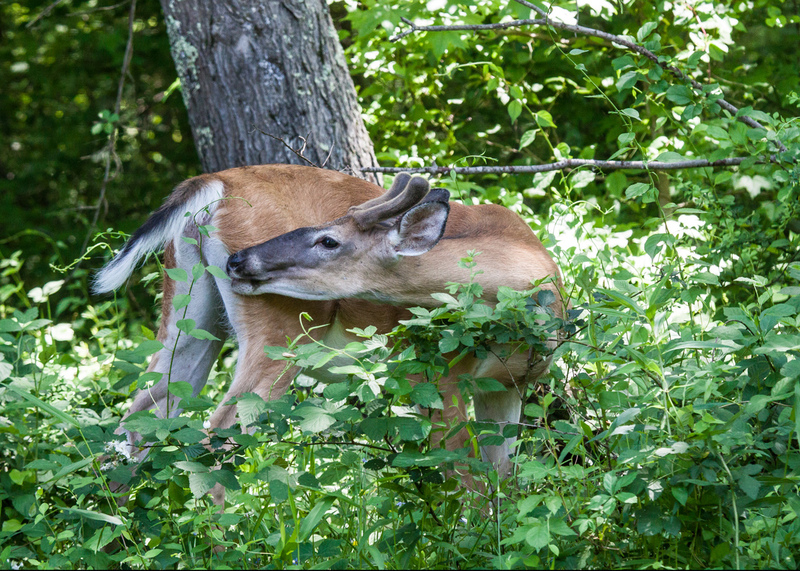 Here are a few shots from my encounter with the young deer. My favorite one might be the first one—I had no idea that deer were so flexible. 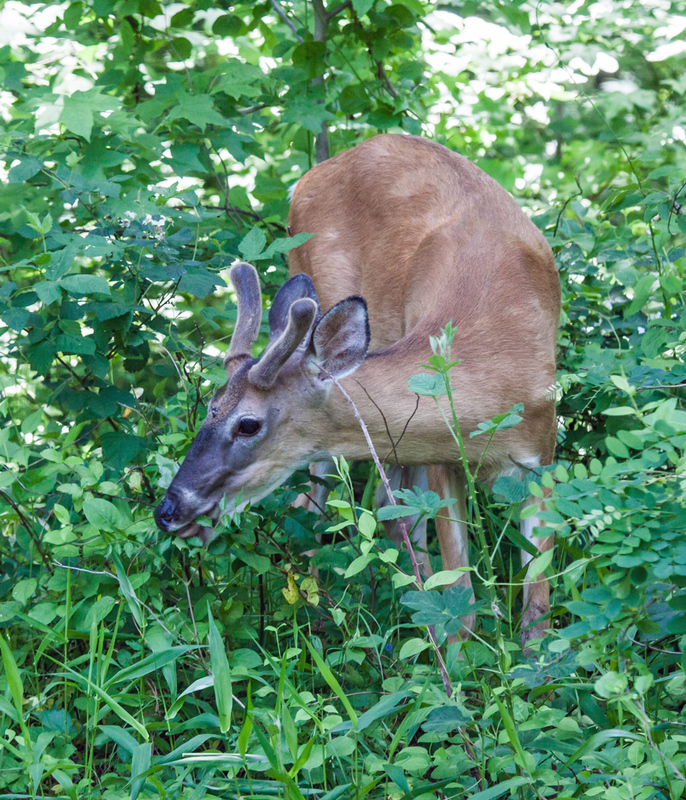 The third image, which I only cropped a little gives you an idea of how close the deer was to me. 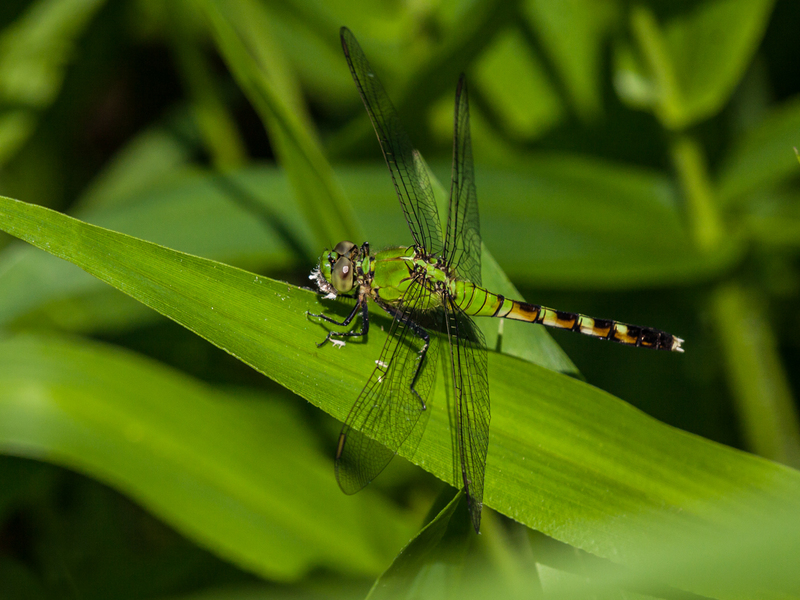 The coloration of this female Eastern Pondhawk dragonfly (Erythemis simplicicollis) helped it to blend in almost perfectly with the lush green vegetation this past Friday at Huntley Meadows Park. This species of dragonfly is not only beautiful, but it is also deadly. 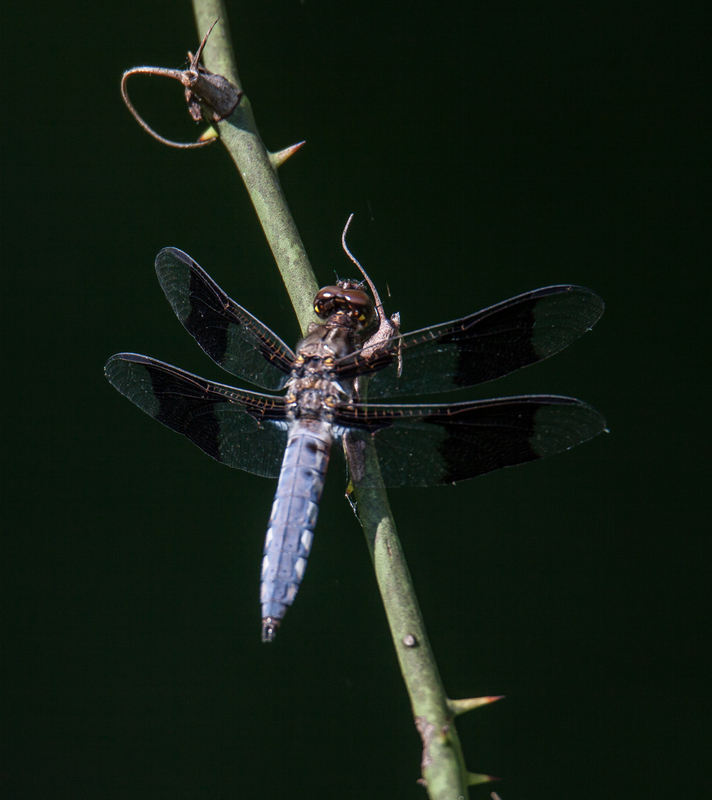 I was reminded of this latter fact when I realized why the dragonfly had stopped and perched—it was consuming a small moth that it had just caught. I love watching Green Herons (Butorides virescens) stalk a prey. Their movements are so focused, cautious, and deliberate they appear to be moving in slow motion. Like the Great Egret that I featured yesterday, Green Herons migrate out of my area during the fall and it is always exciting to welcome back these colorful little herons. 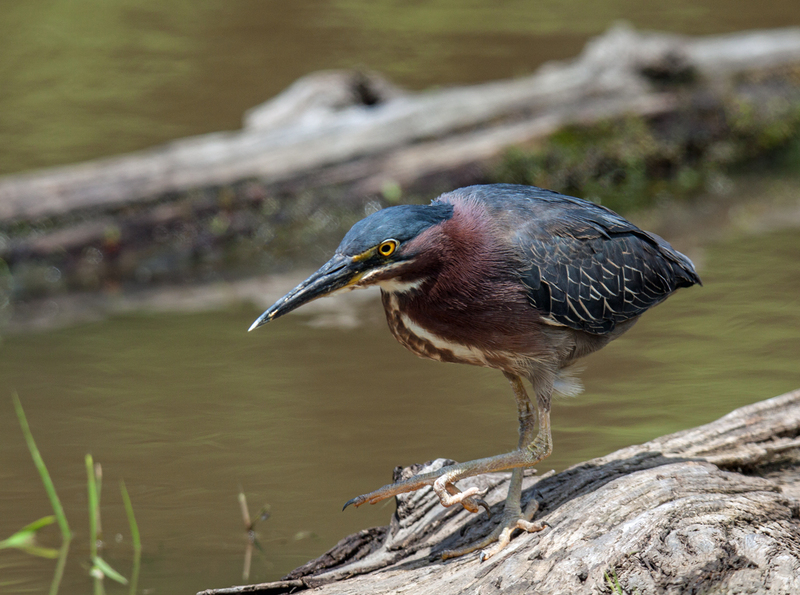 Green Herons often are often hidden in the vegetation at water’s edge, but this one cooperated by moving along a log in the water as it tracked its potential prey. This particular hunt was not successful and shortly after I took this photo, the heron flew off to a more distant location. Every spring I look forward to the return of the elegant Great Egrets (Ardea alba) to our area. Unlike Great Blue Herons, which are with us throughout the winter, the egrets migrate south and return only in mid-spring when the weather has warmed up a bit. One of the highlight of egrets at this time of the year is their beautiful breeding plumage and the green lores (the area between the bill and eye). 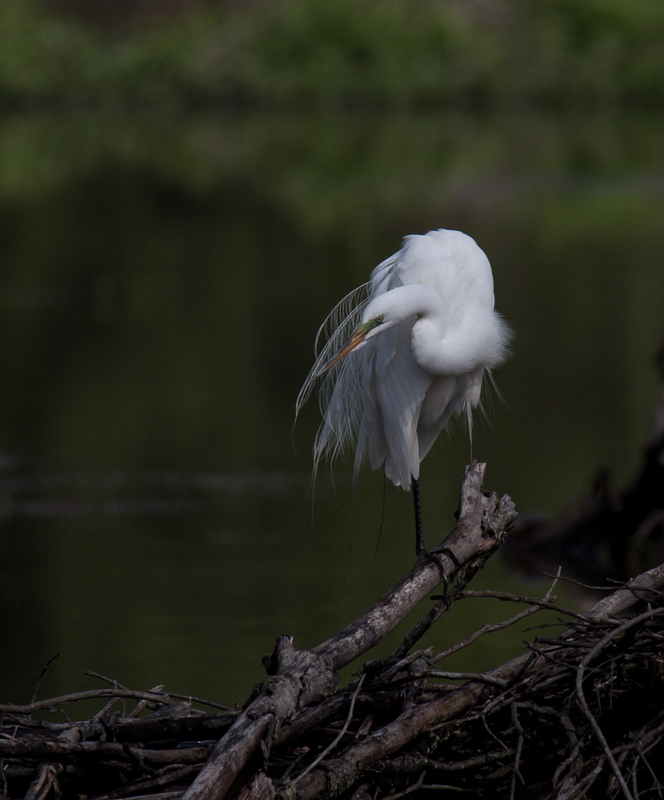 When I spotted an egret grooming itself in the early morning, I was able to capture a sense of the long additional plumes that it was sporting. Unlike Great Blue Herons, which patiently wait for a big catch, this Great Egret at Huntley Meadows Park seemed content with a series of small bites. 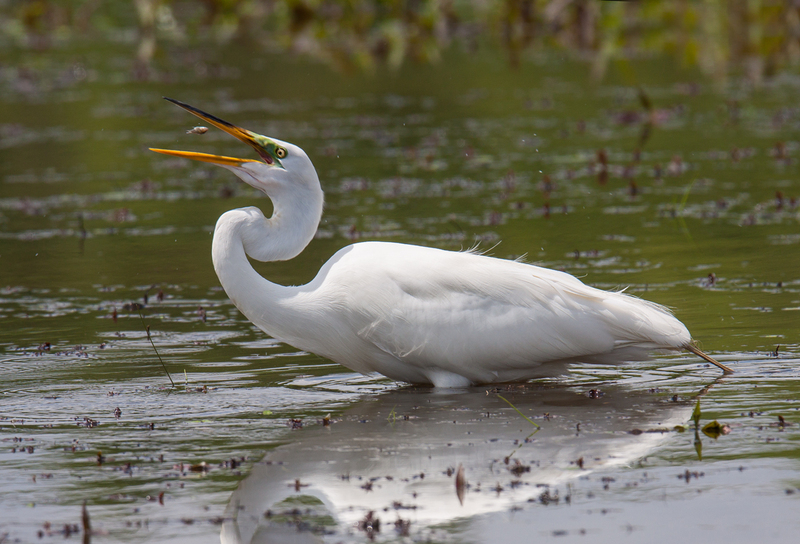 I think that it is a little fish, but I am not entirely certain what the egret is consuming as a snack. 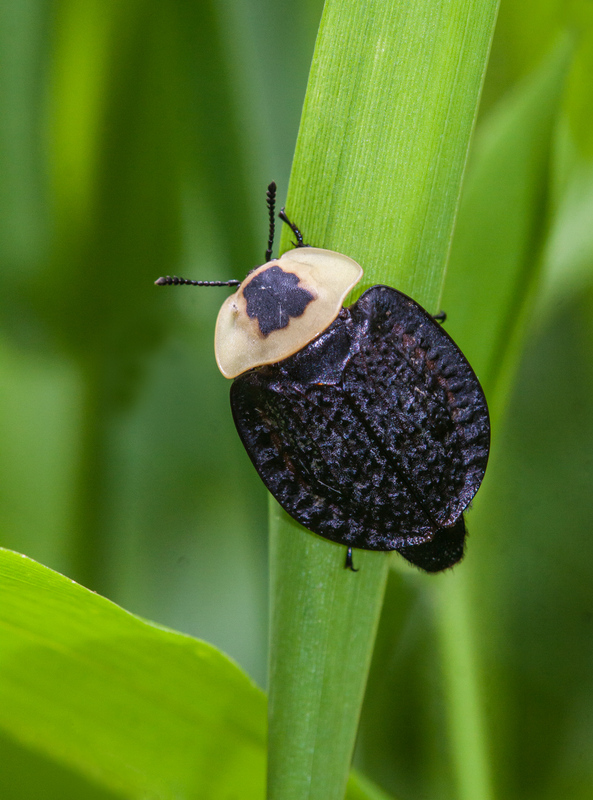 Necrophila americana—what a creepy Latin name for this beetle, known in English as the American Carrion Beetle, that feeds on dead and decaying flesh. Fortunately the backdrop was more pleasant for this specimen that I spotted on Monday in one of the fields at Huntley Meadows Park.